On Friday, March 29th from 6:30-8:30pm the Schaeffer Society will be hosting a lecture in the L. Russ Bush Center for Faith and Culture Seminar Room, Patterson Hall 223. 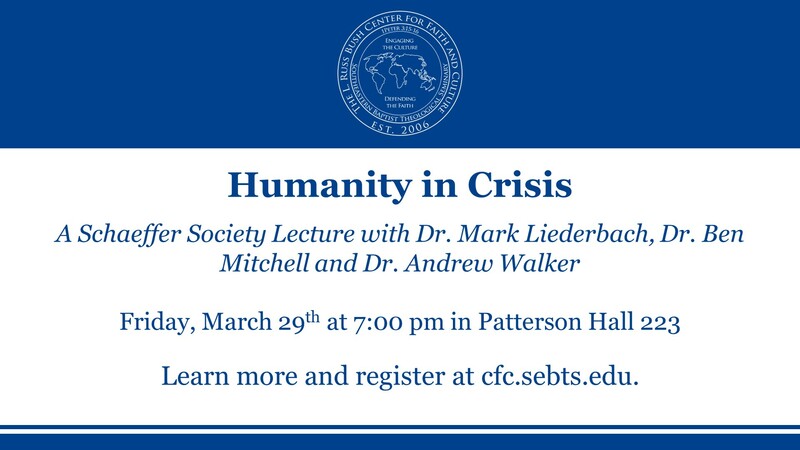 Dr. Mark Liederbach, Dr. Ben Mitchell and Dr. Andrew Walker will each be speaking on Humanity in Crisis. Each presenter will give a 25 minute talk and the evening will conclude with a Q&A Panel moderated by Dr. Bruce Little, Director of the Francis A. Schaeffer Society. Mark Liederbach is Dean of Students and Professor of Theology, Ethics and Culture at Southeastern Baptist Theological Seminary. Ben Mitchell is the Graves Chair of moral philosophy at Union University. Andrew T. Walker is the Director of Research and Senior Fellow in Christian Ethics at the ERLC. Follow the LINK HERE to register!